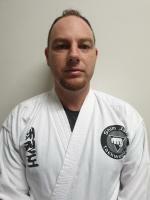 PROFILE: Assistant instructor Cameron Walsh was first introduced to Taekwondo as a young boy. After training on and off for 2 years Cameron could no longer continue due to financial difficulties. Cameron enjoyed the physical and mental strength that he had gained through his training. In 2016, Cameron re established his connection with Taekwondo through the World Shim Jang Taekwondo Academy. Shim Jang Taekwondo shared the same core values he was wanting to pass on to his children through Taekwondo. Cameron is now the Assistant Branch Instructor at the Crestmead centre where both his daughters and wife now train.